You'll be £6.00 closer to your next £10.00 credit when you purchase Hitler's Paratrooper. What's this? Rudolf Witzig entered the history books as the heroic captor of Belgium's supposedly impregnable fortress Eben Emael in May 1940 – the first time that glider-borne troops were used in the war. To many people, he is also known as the commander of the battle group that fired the first shots of the Tunisian campaign. Remarkably, next to nothing has been written about him as an individual. This biography, completed with the full support of Witzig's widow and son, is a comprehensive history of the man and also provides important new detail on the German parachute arm that he served. In the course of his service, he was awarded the coveted Knight's Cross of the Iron Cross. He could not be awarded the decoration because he had not yet earned the Iron's Crosses 2nd and 1st class – to resolve the problem he was awarded all three on the spot. Witzig was involved in Operation Mercury, the invasion of Crete, but was seriously wounded during the fighting. After his recovery, he was sent to Tunisia where he was credited with several successful defensive actions. He ended the war in captivity, surrendering to the Allies on 8 May 1945, the day after his name was placed on the Honour Roll of the Luftwaffe. Rudolf Witzig volunteered to serve with Germany's fledgling airborne forces in 1938, and fought with them throughout the Second World War. He is most famous for leading the dramatic glider assault on the Eban Emael fortress in May 1940, where a small number of men knocked out in hours what had been intended to frustrate a conventional army for weeks. He went on to take part in the successful but horrendously costly Battle of Crete, where he was seriously wounded and, in view of the almost complete casualties suffered by his unit, was fortunate to survive. On his recovery he participated in the protracted defence of Tunisia, before going on to conduct anti-partisan operations in France, followed by a spell on the Eastern Front and then becoming embroiled in a grim series of engagements across Holland to try and halt the British advance on the Rhine. Although Witzig is the central character of this book, with his concise, professional and carefully considered opinions distributed throughout, it is equally the story of his unit and indeed the Fallschirmjager in general, following their transformation from the pioneers of a new and devastatingly effective method of offensive war, to an elite infantry reserve who were frequently thrown into the line wherever the fighting was hardest and most critical. This is an easy and engaging book, taking the reader through the highs and lows of the German experience during the war. Whilst it might be thought that Witzig's life and battles would appeal mainly to those who are interested in the German forces of the Second World War, it is a surprisingly accessible book that can be enjoyed by all. This book is a gripping biography, providing a tough, gritty and compelling study of a German soldier. Villahermosa provides readers with a unique, well-written and impeccably researched account of the Third Reich’s evolving fortunes as witnessed on numerous battlefronts by a highly decorated Fallschirmjäger officer. 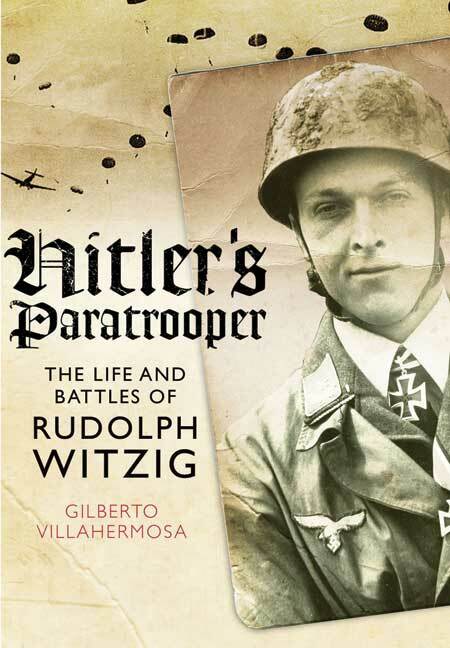 ‘Gil Villahermosa's tough, gritty and compelling study of Rudolf Witzig is much more than a gripping biography of a brilliant tactical leader. Through the lens of one soldier's career, Villahermosa takes the reader on a journey across an entire army's transition, struggle and rebirth. Witzig was a student of life and leadership who found a niche in an institution with a rich and honourable history. Yet this army was also the instrument of a dark force that nearly destroyed Europe. Witzig demonstrated his tactical brilliance literally from the first days of WWII. He was an innovator who proved the worth of airborne troops in lightning fast strikes that became headline news around the world. As Hitler's war dragged on, however, his troops struggled in combat operations ill-suited for light forces and his life became a struggle to keep his men alive day to day. And deep down, he knew that if he survived the war, his family might not. Villahermosa takes the reader across a sweeping stage of world war, following Witzig to its bitter end and eventual rise to prominence in Germany's new Bundeswehr. Gil artfully describes the rise of the post-war German military, its organization and efforts to strip it of politics against the backdrop of the Cold War. Focusing on Witzig the innovator, Villahermosa highlights his demand for the tough combat-like training that led to the end of his career after a tragic accident in a late 1950's field exercise. Through his explication of Witzig's life and career (the author) presents a solid history of Germany's paratrooper force in World War II. At the same time, Villahermosa (himself a US Army airborne soldier) never loses the thread of Witzig's individual endeavours . . . The book is also well illustrated with photos provided to the author by Witzig and his family. Colonel (Retired) Gilberto Villahermosa is an Army Master Parachutist, Strategist, and Military Historian. He holds Masters Degrees from Columbia University and has authored several books, including Hitler's Paratrooper: The Life and Battles of Rudolph Witzig.